3D printing versus CNC: Which one is best for your project? 3D printing versus CNC machining: Which one is best for your project? The use of 3D printing has been growing very fast during the last years and many conversations have been raised over this innovative and game-changing technology. However, the traditional manufacturing techniques have plenty to offer in many domains. For example, CNC machining is one of the most used technologies in competitive industries, such as the automotive and the aeroespacial ones. This traditional manufacturing technology is especially oriented to the production of metallic and plastic parts that are used in engineering projects. Many arguments have been made regarding the comparison between 3D printing and the other manufacturing technologies, such as CNC machining or Laser Cutting. Also at Sculpteo, it’s not the first time we are comparing the manufacturing technologies. In a previous blog post, we talked about 3D printing vs. Laser Cutting. 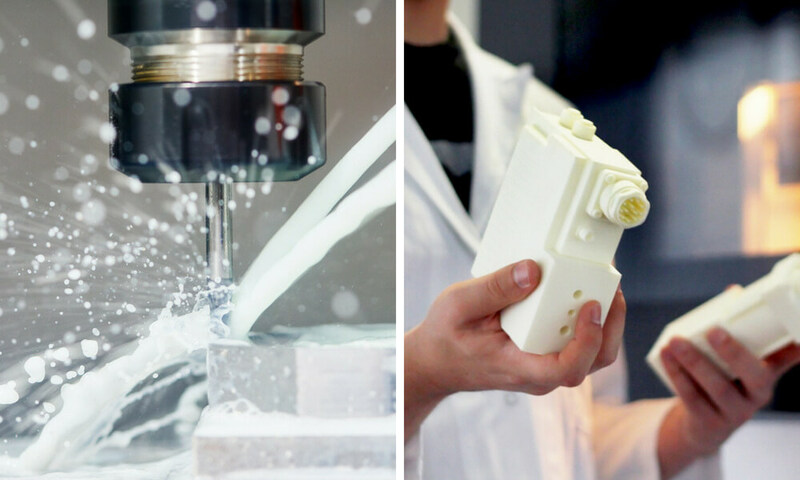 In this blog post, we will go through both technologies, 3D printing versus CNC machining, and see which one will suit your needs better. 3D Printing is also known as Additive Manufacturing. It is a production method that uses the additive process to create an object. The procedure consists of creating the object adding successive layers of material until the whole part is built in three dimensions. This process is operated by a 3D printer. To do so, the 3D printer “reads” a 3D file, that contains the topographical data of the object. In other words, the printer processes a CAD file that includes the shape and the dimensions of the object to print. CNC Machining refers to the same terms as CNC drilling, CNC milling, or CNC turning. This is a subtractive manufacturing technique and consequently, it works the opposite way than 3D printing does. With CNC machining, material is removed from the piece of material that is processed until the final object is formed. CNC stands for Computer Numerical Control. In other words, the computer software converts the design produced by Computer Aided Design software (CAD) into numbers so as to lead the tool of the machine where it needs to cut out the material. How to choose the best manufacturing technique for your project? As 3D printing builds the object layer by layer the 3D printers allow for the creation of internal structures, undercuts or complex geometries and perform well in terms of fine details. On the other hand, CNC machining does not allow the subtractive removal of material of internal features. However, thanks to CNC you can achieve great detail accuracy on the external surface of the object. As a result, if your project involves internal complex parts, overhangs and other kinds of design details that cannot be created with CNC milling, 3D printing is the solution for you. One of the most important points to take into account when choosing the right manufacturing technology for your project is the dimensional accuracy of the parts. With the CNC milling technology, the machines can achieve an accuracy of up to ±0.001 inches and tolerance ranging up to ±0.005 inches. When it comes to 3D printing, the dimensional accuracy of the parts varies between professional and desktop 3D printers. Also, the accuracy depends on the 3D printing technology used and the accuracy of the printer itself. However, in general, the accuracy of a desktop FDM (Fused Deposition Modeling) 3D printer is ± 0.5 mm and the one of an industrial 3D printer is 0.2 mm. For instance, the accuracy of an SLS (Selective Laser Sintering) 3D printer is ± 0.3 mm and the one of a metal 3D printer is ± 0.1 mm. Consequently, if you need to choose between 3D printing or CNC milling depending on the dimensional accuracy of the parts, you should ask the supplier for detailed information regarding the expected shrinkage or warping that may occur during the manufacturing procedure. Another important point that is worth comparing is the production of material waste in both the technologies. In the case of CNC milling, a lot of material waste is produced, as the procedure involves cutting and removing material. On the other hand, 3D printing is more of an eco-friendly technology, as it uses only the necessary material. This fact is often considered as a real pro of this technology. Regarding the production cost of 3D printing vs CNC machining, it depends on the design complexity and the volume of the object to be produced. In the case of CNC machining, the cost to produce a relatively small part can be quite high. However, the production of a big part may be more economical. This is logical if you take into account that you need to pay for the cost of the whole block of material that will be processed, meaning you pay for the object that is created and for the material waste. On the other hand, in 3D printing, you pay only for the volume of the object created. To check out how much it costs to 3D print your design, all you have to do is upload your 3D file on our online 3D printing service and you will get an instant quote for the price. Moreover, you can apply some of our tips that will help you reduce your 3D printing cost and help you make the most out of this technology. For sure 3D printing and CNC machining are not the only available manufacturing technologies on the market. Another great way to give form to your designs is Laser Cutting. Laser cutting is a production technology that is turning 2D designs into objects. As the name implies itself, the laser cutting works with a very precise laser that cuts the material at a very high speed and high accuracy. Laser Cutting is usually preferred for the creation of plastic or wooden parts that are up to 10mm thick. Through our online Laser Cutting service, you have access to many laser cutting materials and you can, of course, upload your 2D file and we will laser cut it for you. Fascinated by the world of production? You can broaden your knowledge about the rising manufacturing techniques by subscribing to our weekly newsletter.